The Upper Valley of Andorno which is more commonly known as the Bursch (den, home, little homeland) is widely covered by beechwoods and chestnut woods. It is closed in an uninterrupted chain of mountains where Mount Bo is the highest peak at 2,556m and is crossed by the largest course of water in the Biellese with incisions made by small valleys to each side which open up towards the valley at the narrowest point which is Bogna at its lowest point. From the thirteenth century passes that are within reach along the watersheds made it possible for people to settle and to form family and economic ties between heterogeneous ethnic groups. This is still clear when we consider family and place names that were originally from Provence, France and Germany. For centuries the paths that were most frequently trodden by man and beast were those that led to Andorno and Biella together with the mountain paths leading to Valle del Lys and Valsesia. The most recently built road was the one to Oropa which was built in the last decade of the nineteenth century, followed by the second stage leading on to Trivero, completed in 1970. These roads were built respectively by the benefactors Federico Rosazza Pistolet and Ermenigildo Zegna. The Upper Valley Cervo became administratively autonomous in 1694, when a decreeissued by Vittorio Amedeo II Duke of Savoy, stated its separation from the marquisate of Andorno and established a new municipality called Valley. This lasted five years; in fact on March 5th 1700, fulfilling the inhabitants’ request to the central authority, it was divided into four municipalities: Campiglia Cervo, San Paolo Cervo, Quittengo and Piedicavallo. During the following decades, the Valley, originally a marginal geographical area, left its status of poor economy and began to enter a socially stable period. This was thanks to the seasonal work of the qualified workers and to the considerable sums of money that were brought back by the emigrants. The improvement of the economic situation along with the encouragement which came with the separation of the municipalities brought the creation of many important works such as roads, stone bridges, the enlargening of local churches and the Hospice of San Giovanni, chapels and bell towers were all carried out in the eighteenth century. IIn 1906, the Municipality of Rosazza was set up due to dismemberment from Piedicavallo, while in 2016, following the merger of the Municipalities of San Paolo Cervo, Quittengo and Campiglia Cervo, the new municipality of Campiglia Cervo was born. In 1973 the Mountain Community of the Alta Valle del Cervo "La Bürsch" was established, with headquarters in Campiglia Cervo, which in 2003 was merged with the homonymous institution of the Bassa Valle to form the Mountain Community Valle del Cervo, with headquarters in Andorno Micca, in turn transformed into the Valle del Cervo Mountain Union “La Bürsch” (2014). 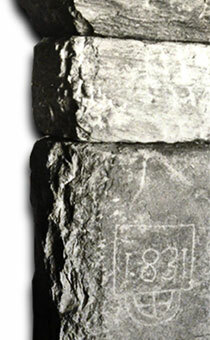 Picture: support with the year engraved, holding the roof in a mountain hut (1831). Alpe Anval (Piedicavallo). Picture by Gianni Valz Blin. Living together in a difficult, varied environment, the limited range of construction materials available brought the inhabitants of the Valley to use resources and the undivided land in marked continuity of space. The types of buildings, their location, the evenly sloping paths, the irrigating artificial canals all derive from a composite general plan discussed within the community, controlled by laws and rules of civic use that establish the possibilities in exploiting the land. The traditional house of the Valley sheltered both the family and the animals; they spent the winter together under the same roof. Agricultural activity was not separated from the dwelling function and they even shared the same entrance. In this way it was possible to reduce working itineraries, avoid land waste and perform a more direct control on the whole cycle of the farming activity. The raising of a few heads of cattle was followed by milk processing, the production of dairy products for family use and, sometimes, their sale at nearby markets. Supporting dry-stone walls built with great mastery using the stone available on the spot, gigantic structures located above the rear of the farmhouses in order to deviate and reduce the risk of avalanches, daring mule tracks running along the precipice, dikes and river-bed bars limit the violence of raging torrents, terraces cutting the slopes in order to grow hemp or enable the woods to grow are all works that witness once more, how much man has been able to modify nature without abusing or offending it, respecting its laws.